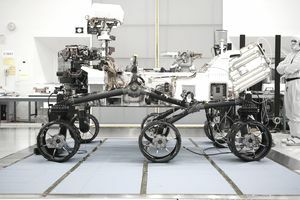 The Mars Science Laboratory (MSL) mission, culminating in the Curiosity Rover's arrival on the Red Planet on Aug. 6, 2012, was the result of years of technological research and human ingenuity in the field of materials science. The rover took about a year to travel from Earth to Mars and was initially intended to function for only about two years. Its mission has extended long past that period. According to NASA, "Curiosity is a car-sized, six-wheeled robot destined for Gale Crater on Mars. Its mission: to see if Mars ever could have supported small life forms called microbes... and if humans could survive there someday! In addition to super-human senses that help us understand Mars as a habitat for life, Curiosity's parts are similar to what a human would need to explore Mars (body, brains, eyes, arm, legs, etc.). In some sense, the Mars Science Laboratory rover's parts are similar to what any living creature would need to keep it 'alive' and able to explore." Those parts include a robotic exoskeleton, computers, temperature controls, sensors and cameras, robot arms, a power system, and a communications system. In order to negotiate the extreme conditions of space travel, atmospheric entry, landing, and exploration, which involve temperatures ranging from 3,790 °F (2,090 °C) to –131.8°F (–91°C), Curiosity and her transport vehicles were constructed using an assortment of metal and composite materials. Bronze DU® metal-polymer bearings are critical components in the rover's drill. Copper Curiosity collects samples in cells, which are sealed in a pyrolysis oven by pressing the cell's copper collar into a knife-edge seal with a force of up to 250 pounds. The sample is then heated to 1100°C for analysis. Lead Curiosity is powered, in part, by a Radioisotope Thermoelectric Generator that will use PbTe/TAGS thermocouples produced by Teledyne Energy Systems. Stainless steel Stainless steel gas generators provided the high-pressure gas used to propel Curiosity's parachute from the spacecraft. Rhenium A RD AMROSS RD-180 booster engine powered the propulsion system used to launch Atlas V. Rhenium is alloyed in the jet turbine. Tungsten The back shell of Curiosity's atmospheric entry vehicle released two sets of detachable tungsten weights in order to alter the spacecraft's center of mass as it approached Mars. Individual ballasts weighed 165 pounds (75 kilograms) or 55 pounds (25 kilograms). Gallium Photovoltaic cells layered with minor and semiconductor metals provide Curiosity with power during the day. Silicon Silicon chips etched with more than 1.24 million names are aboard Curiosity. Copper A penny minted in 1909 (when they were still mostly copper) is onboard to help scientists calibrate the cameras currently sending images back to Earth.